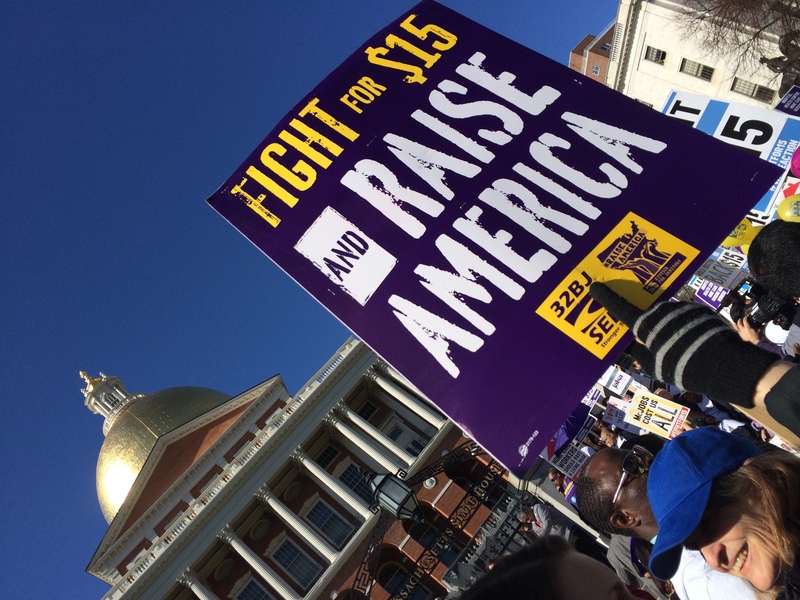 About 10 Emerson students, organized by the college’s Progressives and Radicals In Defense of Employees (PRIDE), joined thousands last Thursday on Boston Common to walk for the “Fight for $15” national and annual day of action for low-wage workers. Paul Sperry-Fromm, sophomore political communication major and member of PRIDE, said the students walked in support of a bill in the Massachusetts state legislature that would raise minimum wage to $15 within the next few years. Sperry-Fromm said it’s important to break down the misconceptions surrounding minimum wage jobs. He said these workers are treated like their positions are entry-level and not stressful or skill-based when, in reality, the opposite can be true. “I’ve talked to workers who are working 80 hours a week that still can’t afford to support their family,” he said. Maria DiPasquale, a senior writing, literature, and publishing major, said she recognizes the struggle of making low wages. DiPasquale works in retail and said it’s hard to pay her rent each month. She said that, despite the fact that she is not yet fully supporting herself financially, she has witnessed the structural inequalities that women, people of color, and other minorities face. James O’Connell, a junior writing, literature, and publishing major, said he’s been involved with PRIDE since his freshman year because the organization’s work allows him to see the immediate results of helping campus employees and domestic laborers. By being involved with the Fight for $15, he said, students are supporting the rights of the people they interact with daily. “There are so many people I know, from students to single mothers to teenagers, that a $15 an hour wage would have such a positive influence on their life,” he said.